Welcome! 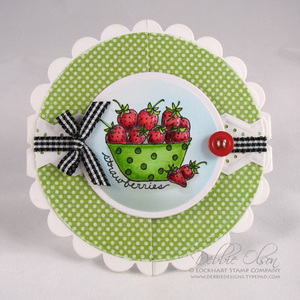 Today I have a friendship card to share using the new JustRite Friends Antique Labels One and Embroidered Background Stamp, as well as the Lace Medallion Labels set from last month. I know it's fall, but sometimes a girl just needs some summer color punches, doesn't she? To cut my shapes, I used a couple of JustRite Custom die sets, Antique Labels One dies, Antique Tags One dies, and Nested Oval Medallion Label dies. To make that scored edge around the outside, I used my Scor-Pal and embossed on the 1/4" line all the way around the green card front layer. To get that inside light pink background on the second layer from the top, I used a Copic R32 and a Copic Airbrush System with my die left in place as a mask. 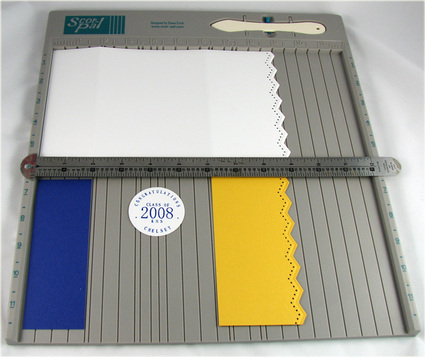 The seam binding was dyed with a Copic R32 reinker. For the little Battenburg Lace layer (from Lace Medallion Labels), I heat embossed detail white embossing powder on cardstock-weight vellum, and then used the back side so that it would not be shiny. Self-adhesive pearls are from my Zva Creative stash. That's it for today. To see more projects with these sets, be sure to check out the following blogs, and thank you for visiting! Welcome! It's finally starting to cool off here, so I'm beginning to think about Fall stamping. Of course it helps to have some pretty new Fall stamps as well! Today I am am using a couple of new Amy Tedder Release stamps from JustRite Papercrafts, Shabby Chic Autumn Leaves and Antique Autumn Tags One. 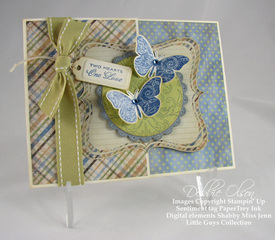 I also used the Fragrant Garden Background Stamp and the Antique Tags One dies. I especially love the leaves because of the script print in them. For the inside I used both leaves and a sentiment from the Shabby Chic Autumn Leaves set. The ribbon slides on and off the card to keep it shut. Here you can see where I attached the Grand Labels Eleven "wings" to the card base. To open the card you have to slip off the tied ribbon that is holding it shut. I kept the foam tape up high enough under the leaves that the ribbon would slide into place nicely. Other Spellbinders die template sets that I used were the new A-2 Fancy Postage Stamps and A-2 Matting Basics B, as well as the custom JustRite Antique Tags One dies. 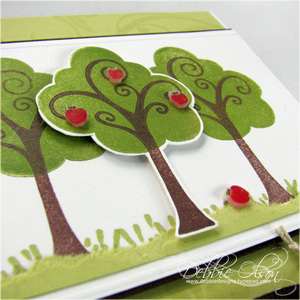 For the card front, I stamped on Rustic Cream cardstock and then colored between the leaves with a Copic E81 marker to emphasize the leaf shapes. That's it for today. If you'd like to see more from JustRite's Amy Tedder line, be sure to visit the following blogs. Thanks for visiting! In need of a guy card today, I thought that I'd play with another Inque Boutique set, Mini Memoirs. I love the little swirly branches of this tree! 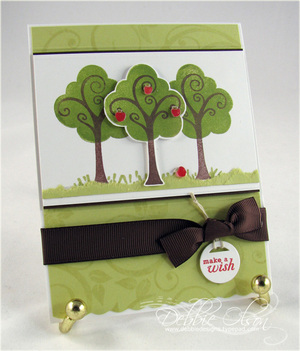 I also really liked the little apple stamp that came with it, but the apples seemed a bit large for the tree. Hmmmm--how about that folder full of shrink plastic in my drawer? Yes! I used my Versamagic chalk inks to stamp four little apples on translucent shrink plastic, then I cut them out and shrunk them. This is a birthday card, but I had that little "the apple doesn't fall far from the tree" aphorism in my head when I was making it. 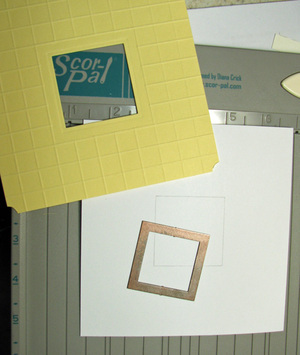 I used my Scor-Pal to add some scored lines at the bottom and top of the focal image panel, as well as on the background layer above and below it. 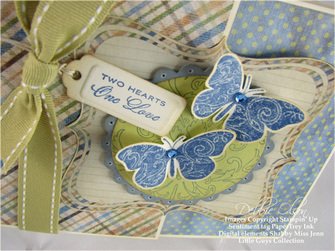 The tag is a Cuttlebug die from their Tiny Tags set, and the scallop on the bottom is made with the scalloping blade on Marvy 's Paper Trimming Buddy. The "make a wish" sentiment is from PaperTrey's Mixed Messages set. Inks are Versamagic Dew drops in Red Magic, Tea Leaves, and Jumbo Java, and PaperTrey's Spring Moss on the background layer. The little grass blades behind the torn edge of cardstock were an experiment. (Marianne's rubbing off on me. ;-D) I used the broad nib of a Copic YG93 on its edge to dot some grass blades on, then I wasn't confident enough to leave them totally exposed. (That's why you see the torn cardstock grass in front!) 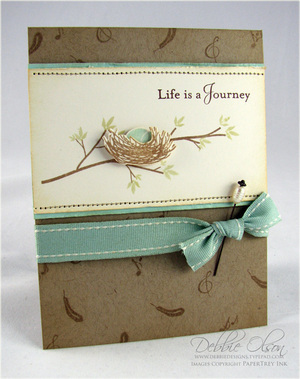 Cardstock is PaperTrey Stamper's Select White and Spring Moss, paired with Prism Suede Brown Dark. Now, my second reason for using this set today is that Inque Boutique told me that they are holding a special Everything Inque Day on Saturday, June 28. What's special about it? How about getting 20% off of your order that day! Anything bought through this Purple Turtle link, using the coupon code awesome will give you 20% off of your order from Saturday through Monday--just a heads up. Happy exploring! How about simply an eye-candy post tonight? I've posted all of the details regarding marker colors, inks, and paper in the PaperTrey forum here if there's something that you'd like to know. I thought I'd pick some of my favorites to share here. 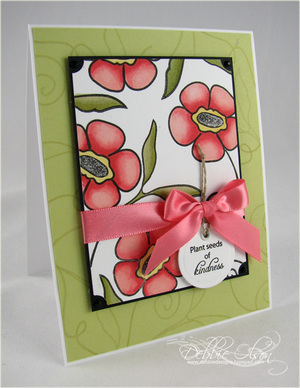 Next, Lisa's Flower Garden set: I couldn't decide whether to show you the one I stamped the outline of and colored in, or the one that I used the solid stamps on, so here are both. I have one more Boards and Beams project, a small framed piece. The color scheme may be stretching it a bit, but I wanted to use the new cardstock colors. We'll call it Victorian. (Ahhhh, the things we're allowed to do on paper!) There's a close-up of the little house here if you'd like to see it. I have to admit to having baby cards on the brain these days, and when I saw this Rock-a-Bye set from Flourishes, I knew I needed it! The focal image is stamped in Pearlescent Chocolate Brilliance ink on watercolor paper and watercolored with some Twinkling H2O's (Buttercup, Pink Cloud, Chiffon Pink, Plum Blossom, Iridescent Violet, and a touch of Bougainvillea). I'll add a close-up image below, but it's tough to capture the shimmer that you can easily see in person. Background paper is Prism Iced Amethyst, and card base is a shimmery white cardstock. 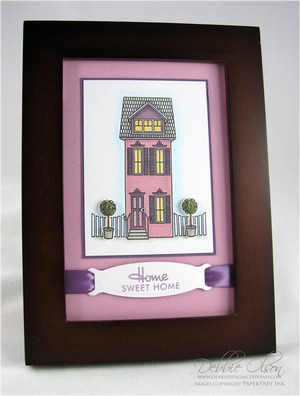 I stamped the "Welcome Sweet One" sentiment on translucent shrink plastic, then cut it out with a Spellbinders circle die. (I usually use a punch on shrink plastic, but my largest circle punch was still a tiny bit too small; the die worked well.) I punched a 1/4" hole for the linen thread, then shrunk the medallion. Afterward, I used a Copic Y17 marker to give the medallion a fain yellow glow around the edge to tie in with the moon theme. 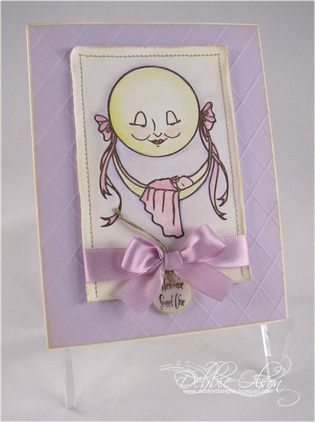 Ribbon is PaperTrey Lavender Moon Satin. I used my Scor-Pal to score a lattice background (tutorial here), and lightly sponged antique Linen distress ink on all edges. It's sweet and simple. Now if I only had some baby-powder scent to spray on it. . . 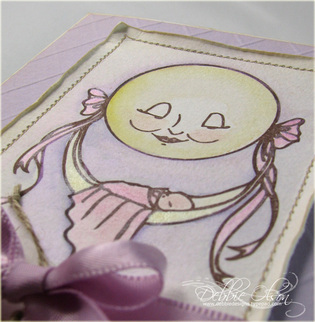 I had several people ask how my scalloped round card for CPS Sketch 66 was made, so I made another card and took some pictures for you. Hope this helps! 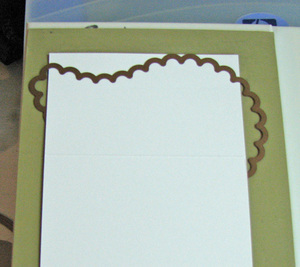 My cardstock was scored at approximately 1-15/16" in from both sides. You can see the score marks in the picture above. I folded both flaps in, making sure that they met in the center, and making sure that the die edges extended slightly past the cardstock on both sides. 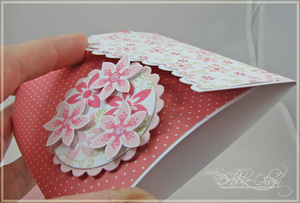 (You need to keep a small area on both sides uncut so that you have hinges when the card is opened. Think in terms of a paper doll chain--remember that you left their hands and feet uncut on the edges so that when you unfolded them, they would be connected?) It also helps to tape the die in place or use your magnetic mat. I tend to work a bit better with tape. This is my card base and card front after cutting. Notice the hinges? 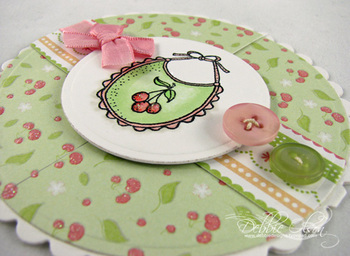 The card mat layer is made with the largest plain circle die. Now, to get the front mat layer cut perfectly, I closed my card and applied adhesive to only one side. Then I made sure my mat circle was in the center of my scalloped circle. Only the left side is attached here. I can now see exactly where I need to cut in order to have a perfect connection. After cutting the front mat layer, I attached it to the right side. This is how my card will open. My focal image will not be split, for obvious reasons. I'll use a little button as a handle of sorts. 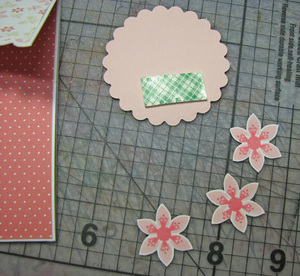 I am also adding a layer on complementary striped paper, cut with the same circle die. Here's a close-up of my finished card. I colored the Bib and Itty Bitty Cherries images with the Copic markers show below. Thanks for visiting! 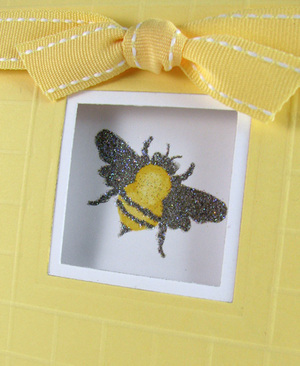 Would you believe that I just LOST my crown stamp for this Honeybees set? Accckkk! It was sitting on my desk an hour ago, and now it has vanished-- probably into a parallel universe. . . ;-D I thought that I'd better get my PTI Blog Hop piece posted even without the Queen Bee's crown. I also photographed a tutorial on cutting windows with Spellbinders dies, but I need to take a meal to someone right now. I'll come back late tonight and amend this post to include the tutorial. Happy Blog Hopping! 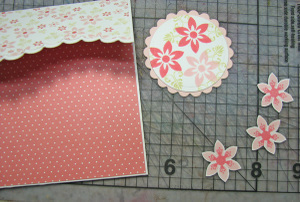 For the last PaperTrey Ink release, I had used my Spellbinders dies to cut a window in both a card front and a mat. I had several questions on how to line them up, so I said that I'd try to illustrate. I thought I'd show you grid-scoring one more time as well. 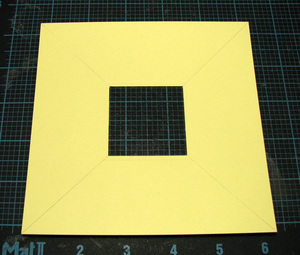 First, since I'm making a square card, I used a ruler to draw an "x" across the card front to determine the center point. That helps me to know exactly where to place my die--no guessing! I used tape across the center of the die to hold my die in place since that part will be cut out anyway. You'll have to take my word for it that the square is embossed as well as cut out. I will erase the lines now. 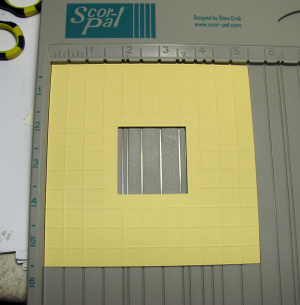 Here I simply held the Lemon Zest cardstock firmly and scored every half inch in a grid pattern, turning the cardstock as I went. I scored the lines nearest the center of the square first because I wanted to stop my lines 1/2" short of the inner square to frame it. When I am scoring a grid and need to be able to see exactly where I am stopping an starting, I find it simplest to use an embossing stylus to score with; it's easier to see where the point is with a stylus than with the provided scoring tool for this particular application. Even using an embossing stylus, if you enlarge the picture, you will see that I went over the line in a few places--no problem! You simply turn your grid over to the front side (as shown above), and use that embossing stylus to carefully burnish the little overruns down flat. As you can see above, while the lines aren't perfect in the center, they are better after the tweaking maneuver. 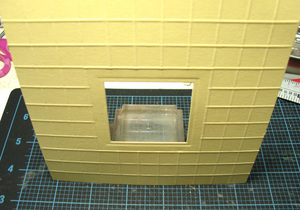 Next comes the window: to line up your inner window and your outer window, first make sure that your top mat fits your card base and has equal margins all around. If it doesn't, fix that. 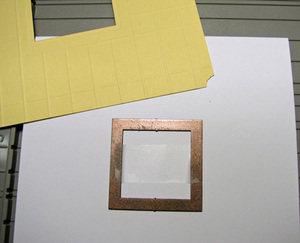 Then place a light pencil mark around the inside perimeter of the square. I will once again tape my die across the center so that it can't slip. I don't have to worry about removing the tape since I am discarding the center piece anyway. 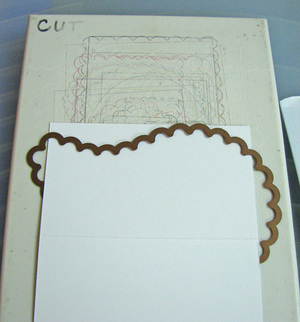 I will simply cut and emboss this piece, and both the mat and the card base are lined up--simple! Newsflash: I just found the crown! It was stuck to my Scor-Pal--the ONE place that I hadn't looked. Woohoo! Have you had a chance to play along with this week's CPS Sketch? There are some truly amazing pieces over there this week! I was just looking at them a few minutes ago. 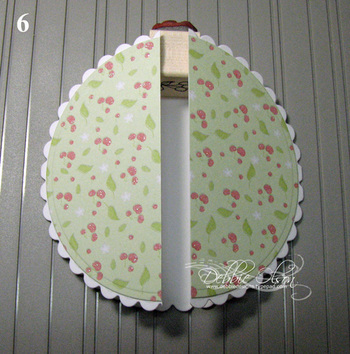 It's a fun sketch--a round card, or at least a round element on a card. Here's a close-up of my CPS 66 card that was posted on Monday. I colored the image with my Copic Markers (listed below), then coated each strawberry with Glossy Accents. The stems are colored with a Melon Spica Glitter pen, and I used my Copic Airbrush system to airbrush the background with my circle die left in place as a mask. 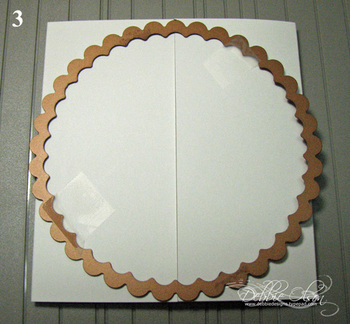 I used my Scalloped circle die to cut the card base, and my Scor-Pal to create a gate fold from the center. 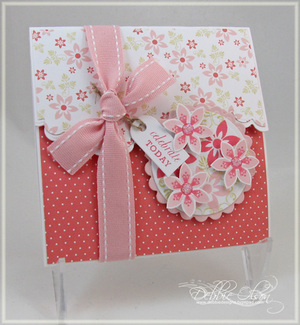 Now, I will try my best to get a Blog Hop card done for 5pm or so! Thanks for visiting. More Graduation Cards. . . In case you're not around this weekend, have a wonderful Memorial Day weekend and stay safe if you travel! It's that time of year; we have four graduation open houses to go to in the next week! That means that I need to get busy with graduation cards. I just finished my first one, totally inspired by my buddy Sharon Johnson's elegant card that she posted a couple of weeks ago. 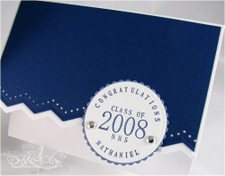 Mine is for a high school graduation, so I kept the style modern and used the school's colors--maize and royal blue. These colors are far from my comfort zone, but it won't kill me to use them once a year. 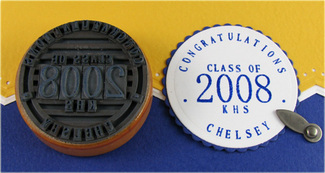 . .
Now, for the focal image, I used the Small Letter set and the medium and large numbers set to spell out "Congratulations," "Class of 2008 KHS," and "Chelsey" on the back of my wooden handle. (Yes, it took a bit of time, but now that it's set up, all I have to change is the name and the school initials for my next three cards!) I cheated on my embossing a bit; I didn't have a pigment pad in royal blue, so I inked my JustRite Stamper in Versamark first, then inked it in my SU Brilliant Blue ink, before stamping and heat-embossing with clear embossing powder. 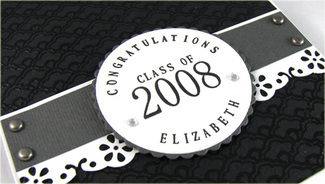 Next I used my Spellbinders Plain circle die to cut and dry-emboss the focal point. 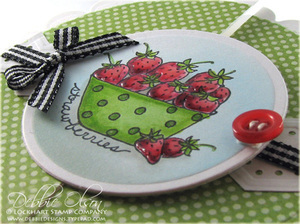 I used my Petite Scalloped Circle die to cut and emboss the cobalt layer to mat the white layer. After placing my matted focal image on the card front and deciding where I needed to place the photo turn, I attached the photo turn through the cobalt layer and adhered the cobalt layer to the card front. 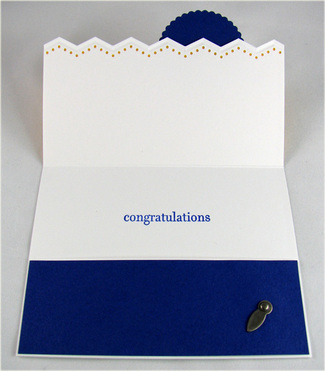 I stamped a "Congratulations" sentiment inside the card and left room to sign our names above the check pocket. Easy! If you read this far in the post, here's one more tidbit of news for you: JustRite Stampers has a new blog and is giving away five large monogram stampers to random people who sign up for their newsletter by Monday. Have you been thinking that a monogram stamper might come in handy? Better go check it out! I loved this week's CPS Sketch! Our sponsor this week was Scor-Pal, so I wanted to incorporate something other than my normal fold. 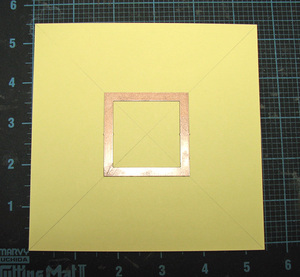 I started with a 4-1/4" x 12" piece of cardstock, then scored it at 3" and at 8-1/2". I then laid it out in a landscape orientation and folded the right flap in first. 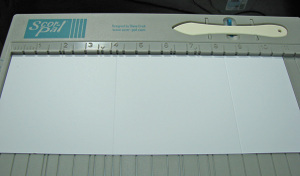 The left flap has the bracket box attached to it. How about those papers? Digital! I wasn't very confident after my hybrid foray a few weeks ago, but I just kept getting good deals on lovely digital papers--the ones that I'm "someday" going to digi-scrap with. When I looked at this week's CPS Sketch and saw a box, I wanted to use a bracket box. I had ordered some online not long ago, and when I got them, they were too large for cards. What I needed was a bracket box that I could control the size of. . . Wait a minute! I started checking my digital files, and there were several choices--woohoo! So, other than the plain cardstock on this card, a natural vanilla (Prism), Bordering Blue (SU), and Spring Moss (PaperTrey Ink), everything else is from Shabby Miss Jenn's Lil Guys Collection. I have so many pink, flowery papers, but I wanted an anniversary card to appeal to both genders, hence the blues and greens. Printer Ramble: When I print digital papers, I have the best luck using heavyweight matte finish paper on best print setting. And if I need only 5-1/2", I resize the 12" x 12" file in my print dialog box to 5-1/2" x 5-1/2" so I'm not wasting ink printing paper that I don't need. Then I can turn the paper around to the other end and print a second 5-1/2" x 5-1/2" pattern, or some smaller elements so that I don't waste paper. I also have a printer for which I can get very economical generic ink, and it will be a sad day when it dies. (It's a Canon Pixma iP 3000. It's probably outdated, but I knew that I would get e-mail asking about it if I didn't tell you what it was. Your best bet on choosing a printer is to check Consumer Reports or something similar. Then check the online ink vendors to see if generic ink is available for the model that you choose. I think my printer was only about $50, so a decent printer doesn't have to cost a lot to buy or to re-ink. Okay, printer ramble has now officially ended. Goodness, I'm quite verbose when I'm typing a blog post during the day instead of the middle of the night! Don't worry: I won't make a habit of it. Have a blessed Sunday! 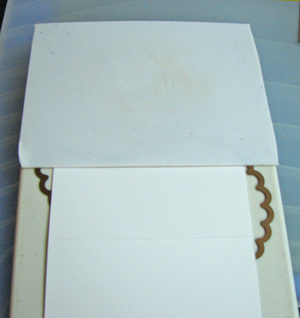 This partially open view shows how the top flap tucks behind the scalloped circle piece in order to keep the folder shut. You can slide the ribbon off and slide it back on, but the card will stay shut with or without the ribbon on. The interior has a scalloped asymmetrically curved top flap, a panel for your sentiment and signature, and a pocket panel for the gift card. That's the gist of it! If you'd like to see my step-by-step process, keep scrolling. . . and scrolling. . . 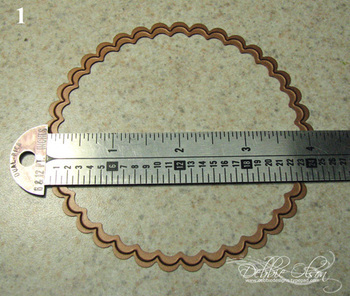 I began with a piece of cardstock cut to 4-1/4" x 11", then scored at 4-1/4" and 8-1/2" leaving a 3-1/2" flap. I used my Spellbinders Paisley Nestabilities to trim the flap asymmetrically. 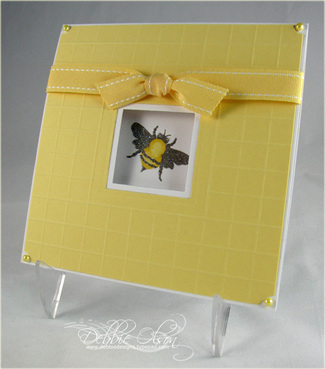 If you are crunched for time, you could use a Coluzzle template to round the top flap, or simply use a corner rounder on the edges of the top flap. 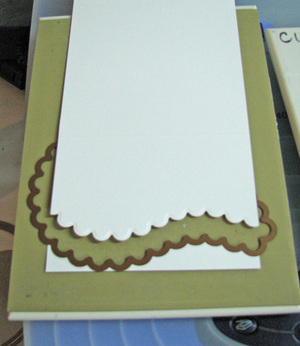 Next I placed my paisley die blade-side down on only the top edge of my PaperTrey Stamper's Select White cardstock. If you look carefully, you can see the score line; that is the score between the top flap and the body of the card. The tricky part is in the next few steps! If you are using a corner rounder, you can skip to step 6. To avoid getting an unwanted crease on your cardstock, place your white spacer plate only on the part of the template that needs to cut. This particular white plate is one that I had cut into accidentally and warped, so I used an old pair of scissors to trim it slightly so that I can fit it through my Spellbinders Wizard without bumping into the side of the machine. 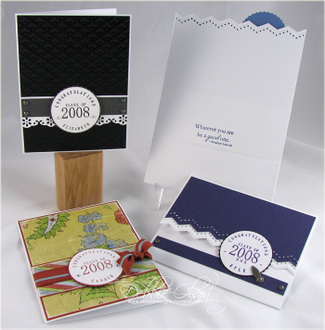 After cutting the cardstock, place it on the tan embossing mat and run it back through the die cutter to get an embossed edge. You can't see it here, but to avoid getting an unwanted crease, I will take this little die/cardstock stack and move it to the bottom end of my plate before sending it through the machine. That way I won't get an impression from the part of the paisley die that I am not using. This is what my embossed edge now looks like. I saved the scrap that I cut from the white cardstock base in order to line up my patterned paper (from the 6" x 6" Pink Patterns pad), then cut and embossed the patterned layer. (I realized after I'd already finished taking pictures that I showed the plain paisley die here, then ended up choosing to use the scalloped paisley die for this layer--mea culpa!) 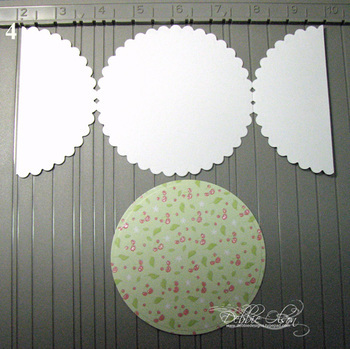 Alternative/simpler idea: you could use temporary adhesive to attach the patterned paper right on top of the cardstock in step 4 and cut them both at the same time. Then you would trim 1/16" off both sides of the patterned paper, attach it permanently to the scalloped base flap, and skip this step! This is what my finished flap looks like now. 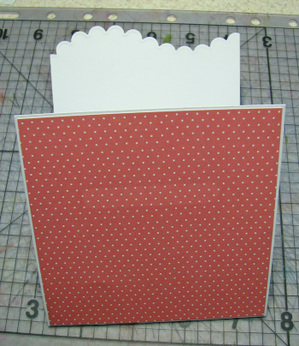 Next, I used my Stampin' Up Word Window Punch to punch the bottom panel of the cardstock base. Be sure to slide the punch in as far as it will go; that way it will be simple to align for your second punch. (One punch will not yield a wide enough opening for a gift card. ) I left about 1" on either side of the card unpunched. This view was shot after I had punched and then folded the cardstock on my scoreline to let you see the punch from the back side. 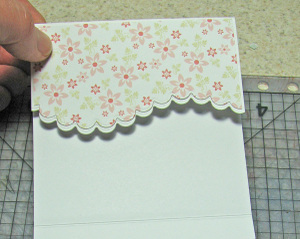 I cut a piece of patterned paper 4-1/8" square to cover the outside lower part of my card. 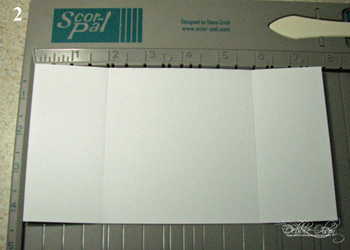 (NOTE: you may need to trim just a sliver (1/32" or so) of cardstock from the bottom edge of the card in order for it to fold perfectly flat.) If you look carefully, you can see a lighter area where my base layer is punched for the gift card. This patterned layer is to cover the hole and form the rest of the pocket. 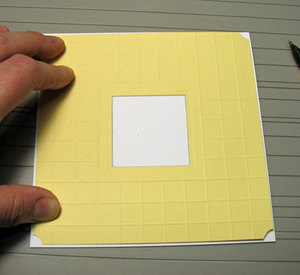 When you use adhesive on this layer, you must take care to put no adhesive where the card will need to slide into the pocket. I used a short length of 1/8" redline tape at the very bottom of this layer to keep the gift card from coming through. 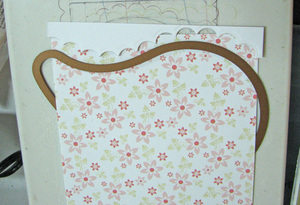 This is an inside view after I added the patterned paper on the outside. You can see the slot for the gift card, backed by patterned paper from the card front, where my paper piercing tool is pointing. To attach the round scalloped layer, I used foam tape only on the bottom third. This is important since the scallop will also serve to hold your card shut. 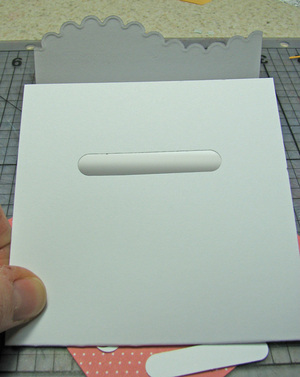 If you get the foam tape too high, you won't be able to tuck the top of the flap under the scalloped circle. This is how your gift card will stay shut--by tucking the top flap under the scalloped circle. 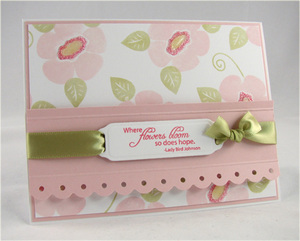 I also added a Sweet Blush Stitched grosgrain ribbon as well as a tag (sentiment from Mixed Messages). 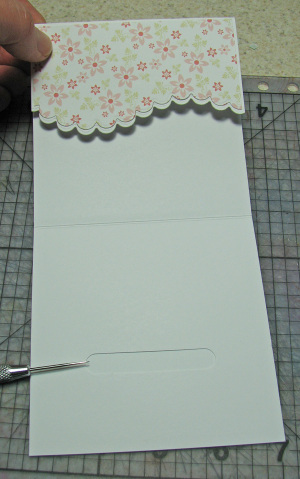 The ribbon can be slipped on and off; it doesn't need to be untied in order to open the card. 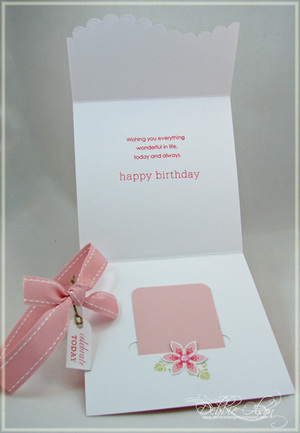 Inside of the card is stamped with PaperTrey's Birthday Basics set, with a cut-out, Stickled flower from the Boxes, Bags, and Tags set added at the gift card slot. If you click on any of the pictures in this LONG tutorial, you should get a larger view. Enjoy, and thanks for visiting! Heather Nichols has a great PaperTrey sneak peek for you today, and I'm quite sure that Nichole will have something amazing as well!